By now everyone knows that the Vikings came to America ahead of Columbus, and some even speculate that Africans had direct contact with South Americans long before 1492. Colón's true achievement, says Eric Williams in his book From Columbus To Castro: The History of the Caribbean, "lies in the fact that his planned voyage was successful and that he was able in over a decade to come and go, between Europe and the Caribbean, as if he was travelling up and down the Mediterranean." Colón was convinced that he had reached Asia by sailing west. "He repeatedly misinterpreted and unconsciously distorted the information he received from the natives," writes Williams, "whose language he could not understand, and who could not understand his." In 1500, another Portuguese navigator named Cabral, following the previous course of Vasco da Gama, was driven to Brazil by strong currents, confirming that an entire continent existed between the known world and India. "He was the last of the medieval crusaders," adds Williams. "The chief significance of the New World, in his eyes, was the opportunity it afforded of bringing multitudes into the Catholic faith." Colón went on to take three additional expeditions to the new world, with his final voyage in 1502. 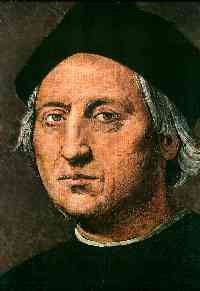 He died at Valladolid on May 20, 1506. NOTE: America was named after Florentine adventurer Amerigo Vespucci, who reached the New World in 1499. His writings were widely published and read all over Europe, shadowing Cristóbal Colón in fame and popularity. It wasn't until the early nineteenth century that the South American republic of Colombia was named after Christopher Columbus.